Free UK Delivery Next Day Delivery! Zenith is one of the oldest watch manufacturers, est.1865 and one of only a handful which has always produced its own movements. The company has an almost unparalleled record of technical achievements and notably, in 1929, Zenith won world renown at Kew Observatory (England), when a Zenith wristwatch won first prize for an accuracy of better than 0.6 seconds per day. During the late 1940s and throughout the 1950s Zenith held the lead in producing the most commercially successful and technically advanced, chronograph wristwatches. Later, Zenith became the first, in 1969, to develop a high-frequency automatic integrated column-wheel chronograph powered by the legendary El Primero movement beating at 36,000 vibrations per hour. This obsession with precision, as well as this constant quest for technical innovation has been duly rewarded; the Manufacture has been awarded 2,333 chronometry prizes as well as eight medals, making it the most titled brand in the field of precision. The company has also provided a huge number of movements to many other manufacturers, for their more technically advanced watches, including even Rolex for their Daytona Chronograph! The 1960s saw Zenith produce some of the finest watch movements available from any manufacturer, and from a technical standpoint, their watch movements were very advanced. The watch we have here is an excellent example, having a semi hi-beat movement and a very high grade single piece, 18ct solid gold watch case which prevents moisture and dust from entering the case either from the rear, as the case-back is solid and not removable, or via the bezel, since it has none! The gold guilloche effect dial, with Gold and Black inlaid batons and matching original ‘stick’ hands, is in the classic 1960s style. The dial has a very fine vertical cut to the dial which catches the light beautifully. Furthermore, this watch dial is completely original and has not been restored or retouched in any way. Remarkably, given its age, this dial is in top condition with no signs of ageing visible to the naked eye. Only very close up, under very high magnification can the slightest signs of scratching and some spots be found. This is extraordinary for a watch over 50 years old and indicates this watch must have seen very light use. 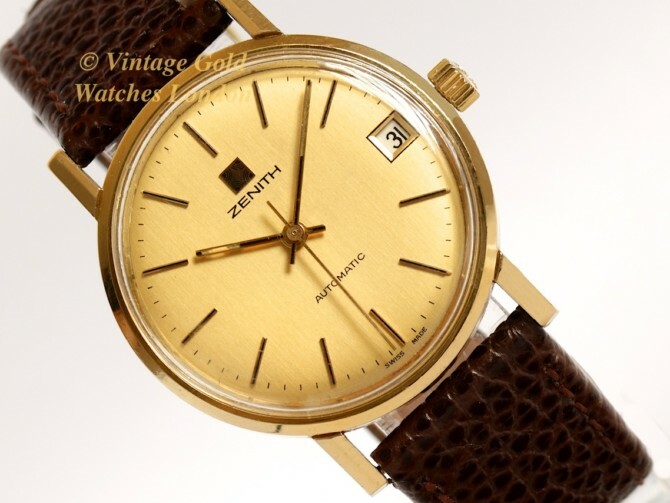 Rather confusingly, Zenith revised their brand several times during the 1950s and ’60s. Or perhaps one could say they didn’t seem to want to stay with any single convention. Here, we have the rarer, applied square Zenith logo, as opposed to the applied five-pointed star, or the applied four-pointed star, or the absence of any of these on the dial, but simply the name ‘ZENITH’ in capitals. The Zenith Calibre 2542PC movement specification is advanced, beating at 21,600 beats per hour, rather than the more usual 19.800 or 18,000 or less. When one listens to the movement ticking, one can definitely hear this difference. Generally speaking the higher the beats per hour, the higher the accuracy of the movement, all other factors remaining the same. This movement is also known as the ‘6 beat’ because it beats at 6 beats per second. It was a very successful movement and used in many of Zenith’s top of the range automatics between 1964 and 1969. The movement has just been thoroughly overhauled and serviced by our watchmaker. This means fully dismantling the movement, ultrasonic cleaning of all the parts, close inspection of all the critical parts and surfaces under high magnification, then replacement when required with only genuine, new original parts. Next, of course, careful reassembly and oiling, using all the correct lubricants to manufacturer’s specification, before final testing and calibration. This watch is now running perfectly, having been calibrated and timed to run within +5 seconds per day! Please note, this timing is outstanding for any watch of this age. The power reserve is very high for a semi hi-beat movement, at 49 hours when fully wound. The watch movement is signed Zenith, Swiss Made and carries the Calibre number 2542PC. The very high quality 18ct solid yellow gold watch case is also very interesting in that it is a one-piece case, meaning the main body, case-back and bezel are all one piece instead of two or more commonly three. The movement and dial are fitted from the front of the case and held in place by the lens which is fitted or removed using a special lens compression tool. This design obviously minimises the risk of moisture or dust from entering the case. The watch case has been cleaned, carefully inspected and lightly hand-polished by our case maker. The case shows every sign it has been well cared for and lightly used and there are no scratches, dings or other marks visible to the naked eye. The case edges are also clear and distinct and show no sign of over-polishing. The case is signed Zenith, ‘Swiss Made’ and includes the Zenith trademark, along with, of course, Swiss 18ct Hallmarks. The case measures 34mm, not including the original signed Zenith crown. The strap fitted is a high quality Brown Lizard embossed leather strap with gold plated buckle. Please note if a different colour or style of strap is preferred, please let us know and we will do our best to oblige, free of charge. We carry tan, conker, dark brown burgundy and black straps in stock, in plain, padded leather, alligator, crocodile or lizard skin. Although there are no original papers with this watch, the reference numbers, markings, signatures and hallmarks are all correct, dating the watch to circa 1969. Detailed particulars will be included with the receipt, along with our 12 months Warranty*. A separate insurance valuation for the replacement value of this watch will be provided at the time of sale along with our unique ‘Lifetime Authenticity Guarantee’ which states: “If this watch proves to be anything less than totally authentic, or not as described, Vintage Gold Watches of London will offer you a full refund at any time”. The watch also comes complete with a high quality hardwood presentation box as shown in the photographs. This is a very impressive and very rare vintage Zenith automatic wristwatch, which is ready to wear and very practical for everyday use. If treated with care, this watch will make an excellent investment or heirloom piece. Zenith has always benefitted from a first class reputation for the superb quality of their watch movements and just as in the case of Longines, which have been undervalued in the past, this is beginning to show in the way Zenith watches are increasing in value. A word on our prices – We always try our hardest to acquire the very highest quality watches we can find, before we then restore them to the highest possible standards. We then offer our watches at the fairest prices we can, taking into account our pre and post sales care and service. This approach means we will never be the cheapest, but nor will we be the most expensive. Indeed there are some well-known stores in West London which are highly successful charging between two to three times the price you see here. We therefore consider our prices to be fair, given the quality of watches we have to offer. We are happy to accept payment via PayPal as this is the quickest method of payment. However, if you would like to pay by UK cheque or by bank transfer, we will be pleased to assist you with this and pass on a 3% saving in transaction charges to you. *Note – Our 12 Months’ warranty is only included if the list price is paid. Please note, we welcome part exchanges.